This home on W. Second St. suffered extensive damage in Saturday’s fire. Fire did severe damage to a home on Fulton’s west side Saturday afternoon. Everyone in the three-family home got out unharmed. 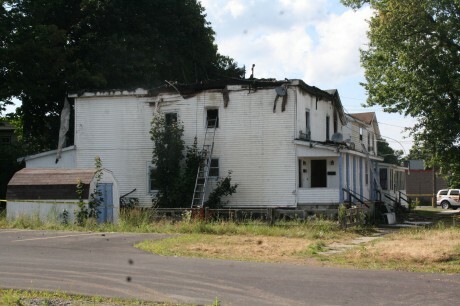 The fire, at 354-356 W. Second St., near the corner of Beech St., required a rare call for the city to ask for help from volunteer departments, according to Acting Fire Chief Paul Foster. He said that the first commander on the scene of the fire put out an “all-call”, which calls in all off-duty city firefighters. But with several firefighters out of town for the weekend or on vacation, the city made a rare call for help to nearby volunteer departments. Foster said Minetto’s fire department sent a truck to man the West Side Fire Station, but ended up being needed to help fight the fire. The Minetto truck came to the fire and was replaced by a unit from the town of Oswego. A unit from Volney manned the East Side Fire Station. Foster said the cause of the fire is under investigation. An American Red Cross mobile disaster vehicle was at the scene to help the people from three families who lost possessions and a place to live.